Save Your Battery Life with Solar! One of the main issues every RVer faces is keeping their batteries charged while on vacation. Nothing is more frustrating than waking up in the middle of the night freezing because your batteries died, or the refrigerator thawed and food spoiled because the battery voltage dropped to low to maintain the refrigerator. Here at RV Supply, we offer a solution for this issue that is efficient and relatively inexpensive. This solution is to let the sun keep your batteries maintained. Our opinion is that every RV should have a solar panel system installed, whether you dry camp or camp with full hook ups. Obviously for those who dry camp, solar is the perfect solution. While you are out riding your off-road vehicles in the desert, boogie boarding in the ocean, or fishing in the Sierras, the solar panels charge your batteries while you are out having fun. There is no better feeling than coming back to your RV knowing you will not have to worry about dead batteries. The solar panels eliminate the frustration of batteries ruining your hard-earned vacation. Now, you might think it is odd that we would recommend solar for those customers who camp with full hook ups, but typically those customers are not out RVing every day. Whether you just plug in your RV and let it sit until your next trip or whether you unload the refrigerator and just let the RV sit unplugged, both scenarios are battery killers. Leaving your RV plugged in will allow your converter to over charge your batteries, thus shortening their life expectancy, since your converter isn’t smart enough to shut off when your batteries reach a full charge. Conversely, the parasitic draws of an unplugged RV will drain your batteries and the batteries will sit with a charge below 50% for an extended period. Lots of people complain that they just are not getting the life span out of their batteries that they expect, and these are the contributing factors. Installing a solar system will solve this issue and help your batteries live to their max life expectancy. When we install a solar system, we install a solar controller. This solar controller is the key component to the solar install. Without it your solar panels would just continually charge your batteries. What the solar controller does is monitor the batteries and give them the charge that is required. All the way from an equalization charge every 28 days, to a trickle charge to maintain the batteries. Most importantly the controller will shut off as soon as the batteries are fully charged thus eliminating any possibility of damaging your batteries. There are two different types of solar controllers, called the PWM and the MPPT solar controllers. The PWM, or Pulse Width Modulation, controller is the most common controller used on RVs. This controller will slowly lower the amount of power applied to the batteries as the batteries get closer to being fully charged. This type of controller allows the batteries to be more fully charged with less stress on the battery, extending battery life. It can also keep batteries in a fully charged state (called “float”) indefinitely. The MPPT, or Maximum Power Point Tracking, controller is the best controller you can purchase, as it does everything the PWM controller does and more. When it comes to efficiency the MPPT controller is far superior to the PWM solar controller. The MPPT controller can basically convert the excess voltage into amperage. Finally, a benefit both controllers have is they both prevent reverse current flow. When the sun goes down and the solar panels are no longer producing any electricity, electricity can actually flow backwards from the batteries out the panels, defeating the purpose of charging all day! The solar controller will actually detect when the solar panel is no longer producing any power and will open the circuit, not allowing electricity to pass back through the controller and stopping reverse current flow. 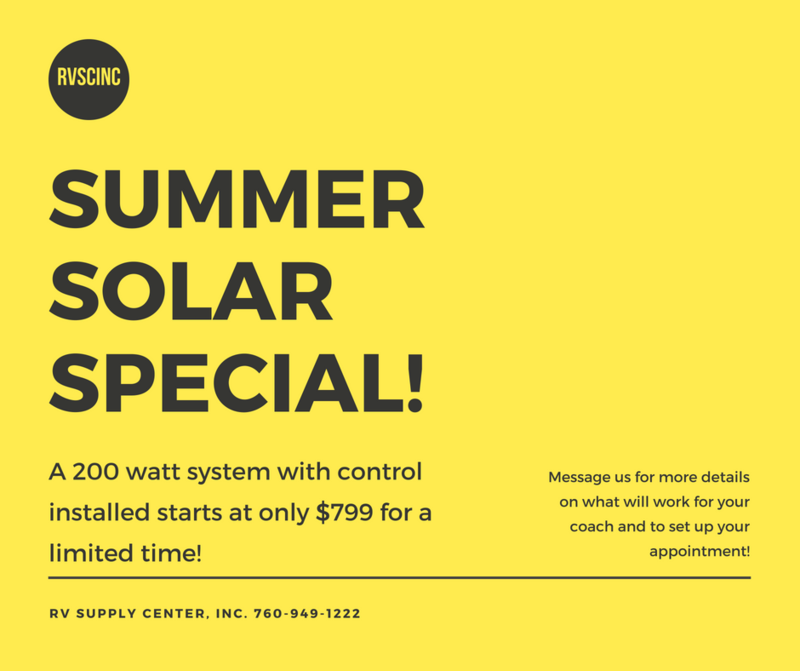 If you want to have a hassle-free vacation, please come talk with us and we will gladly recommend the right solar system for your RV. Service Manager, RV Supply Center, Inc.